Close your eyes and the tantalizing aroma could almost transport you back to Grandma's kitchen. What you're imagining is the artistry of the Terhune Orchards bakers, who regularly transform natural, wholesome ingredients into the best tasting home-baked pies, fruit breads, cookies, and cakes - the kind lovingly made from recipes passed from generation to generation. Our baked goods are so special that they'll become a part of your family's traditions. Our Bakery is open all year and we bake up fresh treats daily. 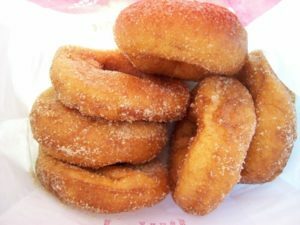 Our famous apple cider donuts, made with Terhune Orchards own apple cider, are baked fresh every day! One of our most popular desserts is plump, moist apple crisp made with choice Terhune Orchards apples and topped with morsels of crumbly brown sugar and cinnamon. Or, try our apple-blueberry or apple-cranberry versions of this classic, filled with lots of cranberries or blueberries! Try delicious Mama's Apple Cake; our gingerbread cake; peach or blueberry cobblers. Our homemade fruit breads are chock full of fresh fruit. Each is a delectable balance of not-too-sweet cake and the choicest ingredients. With over 10 types, our breads are a special treat for breakfast, tea, dessert any time of day. Homemade cookies, fresh from the Terhune Orchards bakery, are always a favorite. Our bakers make 15 different kinds of cookies from traditional chocolate chip and snickerdoodles, to specially decortated sugar cookies, almond crescents, russian tea cakes and more! 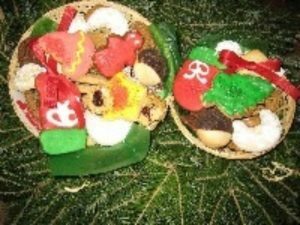 These delicious cookies are available by the pound or for the holiday season packaged as gifts in attractive baskets or trays. Vegan blueberry nut cake. This tempting treat tastes so much like its blueberry coffee cake sibling, you won't believe it is egg-free and dairy-free. Diabetic? Terhune Orchards offers sugar-free pies in apple, cherry and peach. You can't taste the difference! 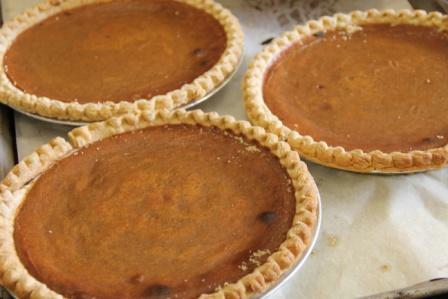 Don't forget to get your pies for Thanksgiving and Christmas at the Farm Store. This year, orders will be taken beginning November 1st. You may reserve your pies to be picked up at the Farm Store Sunday through Thursday, Thanksgiving Day (open 9 a.m. 'til noon only) or at the Trenton Farmer's Market (open Tuesday and Wednesday before Thanksgiving). 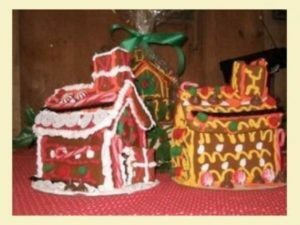 Our handmade, traditional gingerbread houses are a hit in any home! They are drizzled with frosting and outlined with an assortment of gumdrops and candies. Our gingerbread houses also travel well. Let our luscious breads, cakes, cookies, and pies weave magic around your holiday celebrations. Based on treasured recipes steeped in the time-honored traditions of past generations, they embody the spirit of good will and symbolize the hopes for the coming year. These and other bakery items are available daily in the Farm Store. Please call ahead (609-924-2310) for special orders or for large quantities.